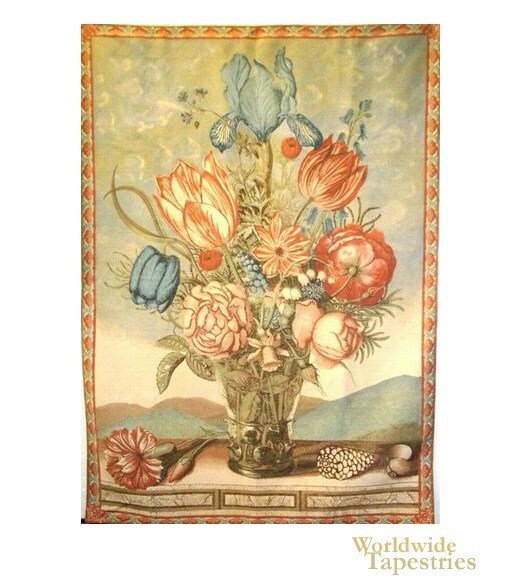 A scene of flowers, shells in a landscape is seen here in "Gathered Bouquet" French floral tapestry. This scene takes the traditional floral still life and adds a modern French twist to create a scene of beauty and fantasy, where mountains and an expressive sky creates a sense of scale and distance in the landscape in the background. This floral wall tapestry Gathered Bouquet" is backed with a lining and has a tunnel for easy hanging.